It all started with forgetting some parts to Sylvia. No hatch hardware or rub rails. How in the heck does someone forget that stuff? But I did. It was three hours away. So we had to go into the water alfresco…Sans hatches. The weather was to perfect. And to be honest, it worked out great. I was able to work out her winter bugs with ease and there was no smell. The blow by issue needs to be addressed. As I went out to take her for her first run, I needed to get gas, so I went to Ingram Bay marina right across the river. It all seemed like an ordinary move. 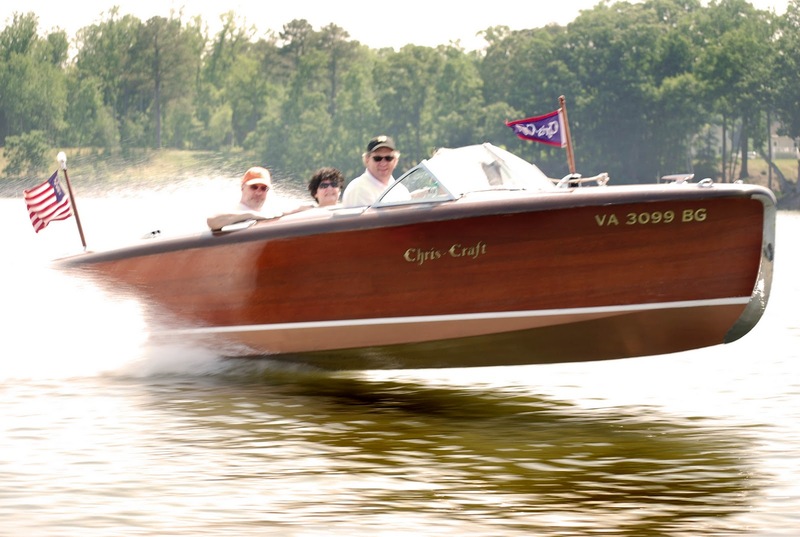 BUT, as I cruised in I saw a killer Chris Craft Cavalier, I thought I knew the boat, but wasn’t sure. And there were dogs barking and folks around, so I did not want to interrupt. I fuel up and start putting out of the little harbor. And cameras are clicking away, dogs are still yapping.. I feel like maybe I am causing a ruckus so I slip away. Well… It turns out it was fellow Woody Boater Jimmy Scott’s boat, as I thought, and that was Jimmy’s dog thinking I was Jimmy, because of the motor sound, and his daughter Jayme was taking photos to show Jimmy that was another idiot who liked old wood boats out there.. Turns out Jimmy had just launched another classic boat. His amazing wonderful after 15 years out of the water.. Chris- Craft Riviera. (More on Yannon later, it is perfect.. 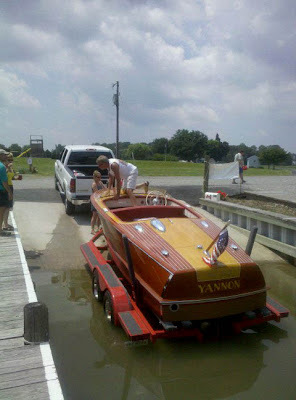 PERFECT.. triple carbs… the whole deal) I found this all out when he came by my dock… And all hell broke loose. 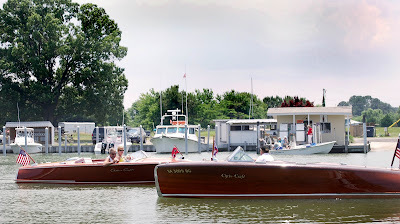 Two fun classic boats chasing each other around the Northern Neck and the Great Wicomico River. It’s not an area were these speed boats are seen a great deal. 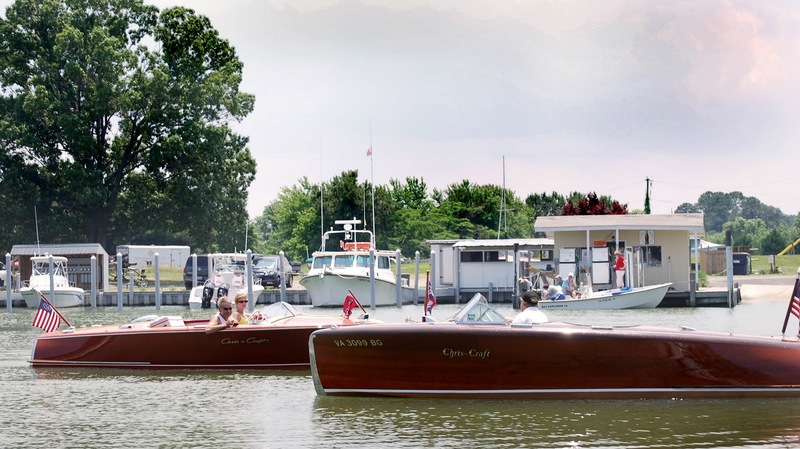 Old deadrises and Skiffs, Cruisers yes. But these little wood torpedoes. No. Getting Ready For Lake Dora On Lake Hopatcong. 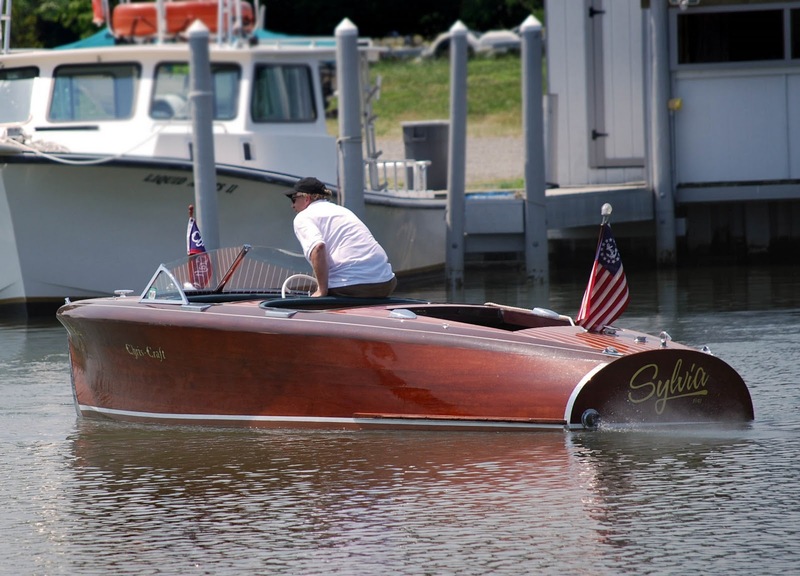 Purchased From Sears In 1952, Brand was ELGIN - But Who Actually Made The Boats? And thats what it should be about, actually enjoying your boat! Does that mean Sylvia is NOT going to Lou's? Dang Matt. You blew your rubrails off. Now that's fast. I started enjoying mine more when I stopped having it judged. The trophy thing is nice you get after a couple….., I still go to the shows but now its just all fun.